A State Supreme Court judge has dismissed a lawsuit by a Prudential Douglas Elliman agent who sued to back out of her contract at the Andaz at 75 Wall Street, claiming her agreement was a sham deal that was designed to promote sales to foreign buyers. 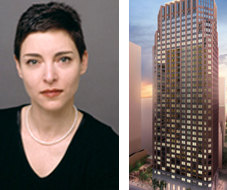 Elliman broker Hela Miodownik filed suit in August 2009 alleging that the developers, led by the Hakimian Organization, did not allow her to close on apartment 21D after all the remaining units in the building were sold, as she had planned. She also claimed that the developer improperly used a broker from Corcoran Sunshine Marketing Group instead of a lawyer to negotiate the condominium unit contract. Judge Ira Gammerman wrote that the plaintiff had no private right to sue for the lack of an attorney, noting that the state attorney general or bar association would have to enforce that provision. In addition, Gammerman wrote the lawyer for the plaintiff should have revised her contract for the unit to reflect that she was supposed to be the last in the building to close. “Having failed to include anything to that effect, plaintiff cannot now ask me to write the contract that she voluntarily entered, which she is presumed to have read,” said Gammerman, in the order released on Monday. Lawyers for 75 Wall said they were pleased by the ruling. “That was pretty much as complete a win as you can get,” said Jeff Davis, attorney for 75 Wall Street. Court documents show that Miodownik negotiated the deal in July 2007 with Corcoran agents Desiree Darden and Larry Kruysman, who represented 75 Wall as the listing brokers. She put down a deposit of $111,000 towards the purchase price of $740,000 and claimed she would not have to close until the units were sold out or the hotel opened up. She also claimed she asked for a right to assign the contract to someone else if she could not close. Miodownik represented several potential foreign purchasers and helped at least one of the buyers to sign a contract, court documents show. She received her first notice to close in August 2008 and after several adjournments, was sent a default notice in May 2009 for failing to close, which led to the litigation. The developer is facing numerous lawsuits under the Interstate Land Sales Full Disclosure Act in federal court in Manhattan. Lawyers declined to comment on those cases. Miodownik was not immediately available for comment, nor was her attorney, Adam Allan, who is also her husband, according to court documents.